All three are for a business model where a professional service uses a website to promote the business. Also suitable, with easy edits, for presenting to a client as “your terms”, without reference to the Internet. Services only, nothing requiring a formal licence. That is at T&C consultancy: professional or expert service; sale of supporting products. Services, where your expertise depends on heavy use of your intellectual property which will be licensed to your client as part of your deal. That is at T&C consultancy: professional or expert service; licensed product. 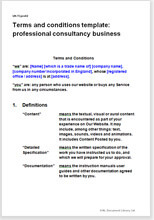 A website terms and conditions document for a consultancy or other professional service. That is to say an identifiable “package” service supplied by a human being. Although a standard T&C document, it covers provisions for a close working relationship. It is not for an impersonal sale of a service. It is perfect for any fixed price package or for work against which you quote a price and leave client to accept and pay via the Internet. Business or marketing consultancy; personal tax return; standard house plans; ISO certification advice; health and safety assessment; distance tutoring. Payment is by a single sum or subscription. Suitable for business or consumers. If in providing your service, you also sell a product, like a DVD, use T&C consultancy: professional or expert service; sale of supporting products. If you want a more formal consultancy agreement look at Consultancy agreements. Over 1,000 words of helpful drafting notes.